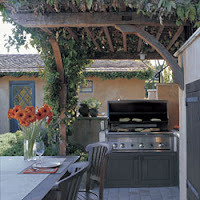 Outdoor kitchens are one of the best hottest home improvement trends. More and more homeowners are installing outdoor kitchens and living spaces in their backyards, particularly in warm climates where the kitchens can be used year-round. With an outdoor kitchen you can prepare meals and be around your guests with minimal time spent running back inside for plates, beverages, or tongs. The key to creating a truly enjoyable space is first to make a well-thought-out design. First thing when planning an outdoor kitchen is consider the function and assess your requirements then select a good location for your outdoor kitchen. Budget will certainly play a role in selecting a location, but often your setting will dictate your choice by providing the perfect place against the house near the back door or out in the garden against the shelter of an old brick wall. Walk around your house, paying close attention to the possibilities. At its most basic, an outdoor kitchen is a place to cook and eat out of doors. Location of the outdoor kitchen preferably near the house to save walking steps carrying supplies. It can be set in a courtyard or out in the garden in a meadow, on a beach, in porch or on a patio of the house. 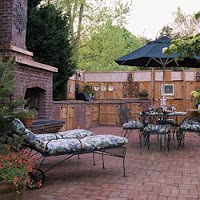 An existing backyard patio can become a great foundation and doesn’t need lot of structural modifications. Other option? Backyard deck for a more elaborate setup. Think about how a cooking area will impact the look of your yard or garden, both from inside the house and from the street. Also, decide how far or near you want this space to be to your home and its indoor kitchen. There are advantages and disadvantages to both.If your yard is tiny and abuts neighbors on both sides, plan your kitchen to minimize the degree to which your noise, smoke, and light will impinge on your neighbors. You also need to consider your own desire for privacy. Durability is very important for an outdoor kitchen, stone veneer is a low-maintenance option that won't need painting or sealing, While Real stone is heavy, expensive, and requires the experience of a mason. Cementitious cultured stone, such as the type used in this project from Landmark Stone, is easier to work with because it's lighter, cuts faster, and lasts just as long as the real thing—all while looking as natural as real stone. After deciding the outdoor kitchen, it’s time to install the grill. The smoke from the grill should not blow into the house or into the faces of family and friends sitting around to eat their meals. Before install the grill, check in first which direction the wind blows in the area. The grill should also be near the edge of a shade structure so that smoke can easily escape and not be trapped by edge of the structure. Trapped smoke over a long period of time can blacken the roof structure and make it look ugly. You are also can consider to install an exhaust hood or a fan, in case that grill has been installed in an enclosed area. A useful feature to incorporate is an outdoor refrigerator, perhaps a smaller one that fits under the counter or near an outdoor bar. Accoutrements for the more elaborate outdoor kitchen might include the grill, a sink, a dishwasher and wine refrigerator. When choosing appliances, be sure they can withstand the weather conditions in your area. 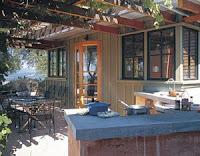 An important aesthetic for the outdoor kitchen is its orientation. The focal point may be a great view, a fireplace, or you may want to design sitting and dining areas around the cooking zone or a swimming pool. Some outdoor spaces even have a television, sound system, upholstered furniture and full dining rooms. Details like stone and marble elements, lighted coffers, elaborate lighting systems, ceiling beams and exterior art are popular for enhancing outdoor spaces.